This is a not so hot version of the Cajun classic. WARNING: I am not Cajun. I’ve been to Louisiana twice, but never to the Cajun parts. I do not make any claims on the authenticity of this dish. 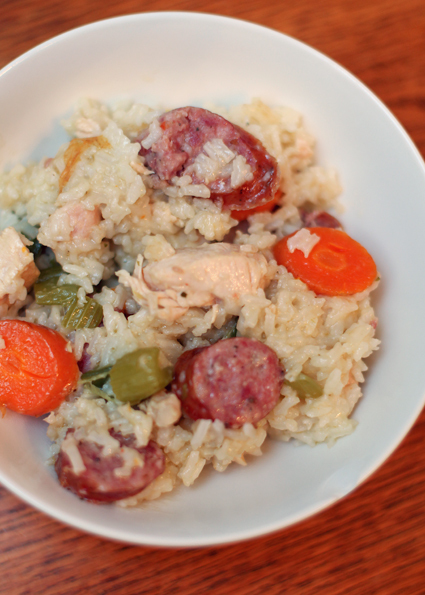 It’s just a nice, hearty, one pot meal we have grown to love this winter. Start all the cubing/slicing/dicing. Heat oil in large pot over medium-high heat. Saute chicken until cooked through (about 5 minutes) and set aside. Saute sausage for 3-4 minutes, until edges brown. Stir in onion, pepper, celery, carrots and garlic. Season with cayenne, onion powder, salt and pepper. Cook 5 more minutes. Add rice and stir in broth, crank it up and bring it to a boil. Cover and simmer at least 20 minutes, until the rice is tender. Stir in chicken, worchestershire and hot pepper sauce**. * Whole Foods Organic chicken broth or Swanson’s 100% fat free “Natural Goodness” broth is highly recommended! ** we often throw in precooked shrimp at the end, especially the second day we eat it.